Edited work by Lois-Ann Holmes, formerly of South Orrington, April 2011. The Clark Falls location is documented back to 1839, when a member of the Freeman family built a flour mill at this site. This mill did not prove successful. In 1850, Vinal Cooper took over this mill site and operated what was probably the first paper mill in the area. The mill made paper from rags, not wood pulp. Rag paper is superior but cannot be produced in large quantities. The mill was still operating in 1860. Sometime after that date, the paper mill burned. Vinal Cooper replaced the mill with a shingle mill which the Johnson Brothers took over after 1880 and converted to sawing barrel headers. They also added a gristmill and cider mill to the operation. The 1900s arrived with automobiles and electricity; there was a decline of industry in town. As of the 1920s, there seems to be no findable record of this mill. There also seems to be no record of the destruction of the buildings which must have been on this site. The site has plenty of remnants of the old mill with some concrete footings, stone foundation remnants, etc. For a video of Clark Falls, see the OHS Facebook page. Another waterway connected to Clark Falls spills into the Penboscot River at the boat landing in South Orrington. It is Walin’tuk Creek. Located in a historic area of Orrington, the name of this creek is now Mill Creek. If one looks upstream, visible are the footings where an old mill used to rest. If you were to follow that stream back from the Penobscot to its origin, you would be at Swetts Pond by the dam. From Swetts Pond the stream meanders down along Dow Road, crosses under the road, crosses below the dead end of Stump Lane, coming down along Clarks Falls Road, going under Johnson Mill Road, over the Clark Falls, meandering some more along Johnson Mill Road, and crossing under Rt. 15 by the railroad tracks near Quarry Road on its way to the Penobscot. In fact, were the concrete and earthen Swetts Pond Dam to breech, this is the flood plain it would affect as has happened twice due to beaver. Article republished from http://www.curranhomestead.org/page30.php with permission of author Bruce Bowden and the Curran Homestead. Photos courtesy of Barry Bowden. Located on King’s Mountain in Orrington, just a short distance from The Curran Homestead, this farm was originally the homestead of an early Orrington settler, Ephraim Goodale. Born in Worcester County, Massachusetts in 1772, Ephraim was part of the large migration of early Americans leaving increasingly congested areas such as Boston and Cape Cod to seek their fortunes in the vast expanses of untamed wilderness in the District of Maine. (After the Revolutionary War, Maine remained a territory governed by the Commonwealth of Massachusetts until achieving statehood in 1820.) He built a homestead at the intersection of the King’s Mountain Road (now called Center Drive) and the busy thoroughfare leading to Swett’s Pond (later known as the Goodale Road); the area came to be known as Goodale’s Corner, and, unlikely as it may seem today due to its rural location, in the nineteenth century it was a hub of activity and commerce, boasting a school, a small store, a brickyard, a harness-maker/cobbler, and a small inn which also housed a post office. Ephraim’s youngest son, Ephraim Jr., married Lucinda Martin (a great-granddaughter of Jonathan Buck, founder of the neighboring town of Bucksport) in 1831, and made this area his home until his death in 1887. The next owner of the farm, Charles H. Chapman, had been a teacher at the nearby Goodale’s Corner School, and, having purchased the home with his wife Laura from Walter Goodale, resided there until his death in 1931. Donald F. Bowden purchased this farm in 1932 from Charles Chapman’s daughter, Onata Deane. Abutting the dairy farm of the man who would soon be his father-in-law, Orrington selectman Raymond L. Perkins, Sr., the farm had fallen into disrepair as Mr. Chapman’s health declined. While courting Mr. Perkins’ eldest daughter, Thelma, Donald undertook major repairs to the farmhouse and its outbuildings, raising them up with jacks and cribbing, leveling them, hewing new sills and beams, and generally “setting things right.” Donald and Thelma were married in 1934 and began a half-century-long career in farming, which included a dairy herd, wood products, an apple orchard, raising vegetable crops and rearing six sons. The farm Donald purchased was not overly large, even by modern standards; at the time of sale, it totaled just over six acres. With the gift of ten acres from his father-in-law’s adjoining farm and gradual purchases of abutting and nearby woodlands, the farm eventually comprised several hundred acres, though most of it was not contiguous. 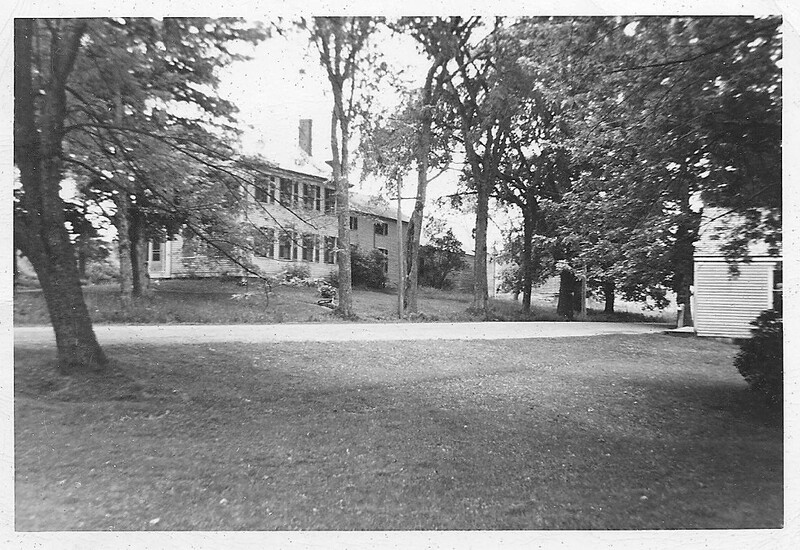 The farm of Donald F. and Thelma (née Perkins) Bowden at Goodale’s Corner in the 1940s. Originally built by early Orrington settler Ephraim Goodale in the early 1800s for his son Walter, the structure was destroyed by fire in 1958. The small clapboard building at far right is the country store owned and operated by Donald’s first cousin (twice removed) Walter H. Bowden. On February 15, 1958, in the wee hours of a bitterly cold Maine winter’s night, the wood-fired furnace failed and the tinder-dry timbers of the old farmhouse erected nearly a century and a half before caught fire. The family, clad only in their nightclothes, fled to a neighboring house to escape the subzero temperatures; Donald remained on the scene to await the fire department’s arrival and ensure that any potential passersby, seeing the house engulfed and unaware that all had escaped safely, would not attempt a rescue. The entire house burned to ashes. No one in the family was injured, but all of their personal possessions were consumed in the conflagration – with the exception of two leather coats and a chainsaw. Fortunately, due to the fledgling Orrington Volunteer Fire Department’s diligent efforts, the flames were stopped at the wood shed, thus sparing the remainder of the farm buildings and the dairy herd. With their home destroyed, the family relocated to the nearby home of Clifford and Beulah Bowden (who were Donald’s brother and Thelma’s sister), and the Bowden dairy cattle and other farm chores were tended from a slightly greater distance. Over the course of the following spring and summer, the community rallied around the family, helping Donald saw lumber from timber harvested on his woodlots, pouring a new concrete foundation, and constructing the new farmhouse. Assistance from neighbors, relatives and concerned community members made work progress quickly, and the Bowden family celebrated Christmas in their new home that same year. 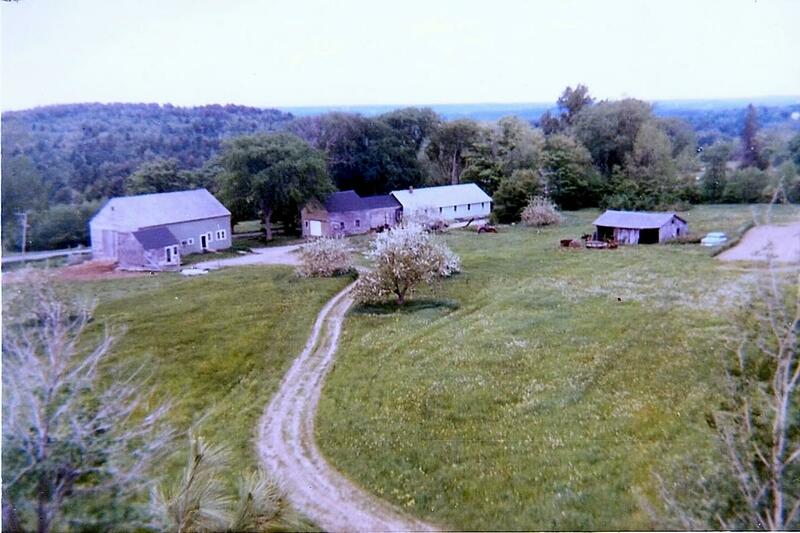 The Bowden farm in May of 1967. Donald and Thelma’s fourth son, Barry, who had graduated from the University of Maine at Orono that same month and was preparing to seek his destiny in the world, climbed to the top of a tall pine tree in the fencerow between the pasture and orchard, and took this photograph of his boyhood home in its last years as a dairy farm. At left is the barn and milk house; center, the garage, wood shed and farmhouse (which was rebuilt after fire destroyed the original in 1958); at right is the shingle mill. After their youngest son Keith graduated from the University of Maine and left the area, Donald and Thelma sold the last of the dairy herd; the labor-intensive nature of dairy farming was not well-suited to a one-man operation. Donald and Thelma’s grandson Bruce remembers a visit from his grandparents just after the last cow had been sold; as they were about to leave, Donald stated the he was going to do something that he had never done before: After more than a half-century working as a dairy farmer, he was going to buy milk in a store on the way home. Even though their dairy herd had been sold into other pastures, this was not the end of agricultural activity at the Bowden farm. With the demands of dairy chores such as milking and haying now absent, Donald and Thelma focused their attention on their apple orchards. Donald had planted an orchard comprising over 150 trees in the early 1930s, and these trees bore fruit for the rest of his life. In addition to favorite apple varieties such as MacIntosh and Cortland, there were also pears, plums and apple cultivars which are no longer common: Yellow Gravenstein, Red Astrachan, Red Spy and Northern Spy. In the early 1980s Donald renovated a cider press given to him by his neighbor and brother-in-law, Raymond Perkins Jr., and folks who were fans of Donald’s apples now had another reason to anticipate cool fall weather: cool gallon jugs of sweet cider, freshly pressed from his apples. The Bowden orchard, May 1967. 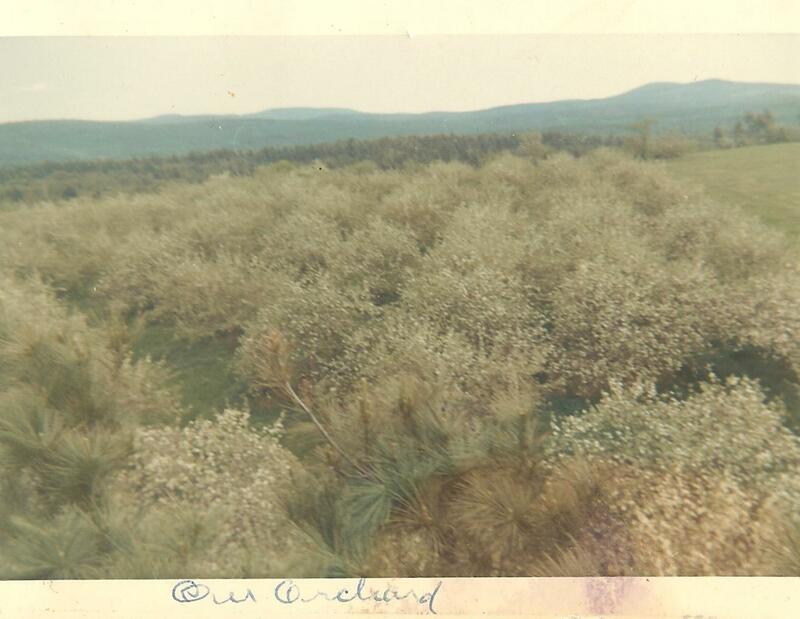 After taking the previous photograph of the farm buildings from atop a tall pine, Barry turned 180° and captured this image of the trees in his father’s apple orchard in full bloom. In the distance (though not discernable) is Brewer Lake. Donald passed away in late 1992 after several years of declining health, and Thelma continued to reside at the farm for another decade, when her own failing health necessitated a move to an assisted-living facility in nearby Bangor. The farm sat idle for the better part of a decade, with the exception of annual mowing of the pastures by Donald and Thelma’s eldest son Richard. Thelma passed away in 2008, aged 96. A new chapter in the history of the Bowden Farm has just begun: Donald and Thelma’s youngest son Keith has moved into the home of his youth, and another generation of Bowdens is in residence on the farm Ephraim Goodale carved out of the wilderness so many years ago. This article was likely published around the year 1919. Although the author and newspaper are unknown at this time, it’s possible that it was published in the Bangor Commercial. The death last week of Captain Joseph Atwood Brown of Orrington marks the passing of one of the last old time ship captains. He was born in North Orrington July 1, 1831, oldest of the five children of Cornelius and Eliza (Smith) Brown. His father being a ship captain, he was early attracted to the sea and at the tender age of eleven went summers as cookee with his uncles Charles and Stillman Brown. At sixteen he began in earnest, making long voyages to foreign ports. He continued in this chosen calling for fifty-one years, making 101 round trips to the West Indies alone, besides visiting many European countries. In 1854 he married Rebecca Bartlett, daughter of Samuel and Mary (Snow) Bartlett, who died nine years ago. He leaves two daughters, Mrs. Cara M. Conley of Brewer and Mrs. Leland B. Blake of South Orrington, and two grandchildren, Mrs. Charles Spinney of Brewer and Mrs. Fred Dionne of Dorchester, Mass. In the early seventies he made a trading voyage up the west coast of Africa, sailing up and down that coast and trading at the different ports. He remained there eighteen months, the entire voyage taking about three years. While there he contracted the dread disease, yellow fever, the effects of which followed him through life. Two other times he was stricken with this disease. Once in Pensacola, Fla., where the Masons saved his life by taking him into their private hospital and nursing him until he was able to join his ship. The third time was in Havana, Cuba. His vessel was due to sail and the American consul said he must leave her and go to a hospital, but he pleaded so hard that they put on board an old negress, who had relatives in New York and who understood handling the fever, and he sailed. The negress tended him so well that when the ship reached New York he was able to be on deck. For many years he commanded the schooner Fred Smith, sailing for the old firm of Smith Brothers of New York. On many of these voyages he carried his family, visiting many South American and West Indian ports and remaining away from home months at a time. Later, leaving the Fred Smith, he turned his attention to barging, at the time when that business was in its height. Among others, he commanded the barge Roman, remodeled from the old steamship of that name. On a voyage in her, heavily laden with 1,700 tons of coal, and having with him as mate his son-in-law, the late Capt. Samuel M. Conley, he was shipwrecked off the coast of Virginia. Thinking the barge was riding heavily, Mr. Conley lowered a lantern into the forward hold, when the rush of water swept it out of his hands. Hurriedly reporting the condition and signaling to the tug boat, he rushed to the captain’s cabin, seized a dunnage bag and filled it with what he could find, ordered the life boat to be lowered and then went to report to the captain, whom he found calmly steering. “My place is here; I shall not desert my ship,” was the reply. Mr. Conley did not stop to bandy words. He called the men and they bore him kicking and struggling to the boat, where he collapsed in the stern. As they pushed off from the sinking ship it was discovered that a great hole had been made in the boat while lowering her. A sailor thrust his oil jacket into the aperature, Mr. Conley took charge; the sailors rowed with almost superhuman strength, and the boat made its way over the waves mountain high to the tug, Storm King, which, a few days later, landed them safely in New York. A humorous incident of the affair was that, although the dunnage bag contained quite a number of boots, no two were mates, and when the captain reported at the office in New York he had only the water-soaked garments in which he stood. All his nautical instruments, marine glasses, charts, etc., were lost, as well as his clothes. In 1892, being a yellow fever immune, Capt. Brown was sent to Santos, Brazil, to recover the bark Archer, whose crew all had died with the fever. Orders were to take her to Turk’s Island, load with salt and proceed to New York. The bark had lain so long in that terrible heat of Brazil that her calking was poor, but, in spite of this, picking up a scrub crew in the fever-stricken port of Santos he set out to follow directions. All went well till the salt was loaded and they were started homeward, when the vessel began to leak like a sieve. The crew became mutinous; they said they would leave her, would not pump, etc., and when told by Capt. Brown that they must, said they would soon dispose of that little man and desert the doomed ship while land was near. In the midst of this confusion, Capt. Brown appeared on deck, a small but formidable, figure, with a revolver in each hand. “The first man who refuses to pump, dies,” he calmly announced. One look decided them. They turned to the pumps. Before reaching New York, however, they were overtaken by a severe gale, dismasted, and finally driven into Bermuda, where the vessel was sold. This was Capt. Brown’s last voyage. Later, he entered the employ of the late J. Weston Hopkins, working in the Hampden Creamery, when it was located in Hampden, following it to Bangor when it was moved and remained here till 1899, when he sustained a severe injury, being thrown violently from a high cream cart onto a concrete floor, breaking his collar bone and injuring his head. After recovering somewhat from this injury, he moved onto his little farm in Orrington, making his home there till the death of his wife in 1913. During the last six years he has lived in the home of his daughter, Mrs. Leland Blake, gradually failing until the end found him in fancy once again the commander on the quarter deck, giving his orders, guiding, directing, until his Ship of Life floated out of the troubled waters and found anchor in the peaceful Haven of Rest. When I shall cross the Bar. Originally Posted: March 1st, 2005 in The Working Waterfront. This article has been republished with the permission of The Island Institute. He calls himself “Earl on the River” and when you hear his story, you’ll know why. Earl Morrill is a 58-year-old resident of South Orrington who specializes in building scale models of 19th-century Maine sailing vessels. I first met him in the summer of 2003 while I was doing research for an article on the history of the Penobscot River. I soon discovered, however, that in addition to being a superb builder of historic model ships, Morrill was a veritable storehouse of information about the Penobscot. But that’s another story. “All this history, and my great-great gramp being part of it, just got me started researching,” Earl remembers. “The more I found out, the more I wanted to build an historic model from the keel up.” Earl was in his 20s when he began a model of Atwood’s ship, the HAZZARD. “I had done the research,” he recalls. “However, I soon realized that I was way over my head trying to build a model boat.” He stopped for three months and gave himself a crash course in shipbuilding, which included studying everything he could find on the subject in the Bangor library. When Earl finally finished the HAZZARD, he admits, “She was a little crude, but eventually I sold her to the owner of The Harris Co. in Portland.” The owner, Austin Harris, has since retired, but when I spoke with him recently he assured me the CHARLES S. HAZZARD is prominently displayed in his parlor in Yarmouth. Morrill’s second model-building effort was the four-masted schooner JAMES E. COBURN. He remembers finding a picture of her while she was being built on Mill Creek in 1919. “Historic model building took a long time in those days,” he recalls. Mostly this was because of the time it took for research and the fact that everything came by regular mail. Even now, before he begins a project, Morrill does months of research on a ship. His model of the COBURN can be seen today in the Orrington Historical Society. He continued to improve his skills when he next built a model of the S.S. ROOSEVELT, the ship Admiral Robert E. Peary took to the North Pole in 1908. Earl’s great-great uncle, Maynard Wardwell, was Peary’s chief engineer on that expedition. The ROOSEVELT was built in 1905 on Verona Island just south of Bucksport. Appropriately, Earl’s model of the ship has been on display in the Buck Library in Bucksport for the last 10 years. “By the third ship, you are hooked,” he says. “You know you can do a better job on the next vessel and you drive yourself to a higher level of accuracy.” Earl now waits for orders before starting to work on a ship. Today he posts pictures of his models on his website, www.geocities.com/mainecoastersriggers. [This article was published in 2005, and this link is no longer valid.] He builds his ships to scale 1/4″=1′, plank on frame. “I can scratch-build a schooner from the keel up in about 7-9 months,” he says. Morrill works only on Maine sailing ships and insists they must be documentable and original (the first model to be built). A number of years ago, the owner of a local newspaper saw the S.S. ROOSEVELT on display in Bucksport and asked Morrill to build him a vessel. After some negotiating, he agreed to build a historic model of the brig TELOS, out of Bangor, for $9,000. In this case, his client even agreed to do the research. Morrill is particularly proud of the model he made of the SPITFIRE, a fast clipper ship built in 1853. At one point, she held the record of 106 days for the fastest trip from New York to San Francisco. The SPITFIRE is currently on display in the Searsport Marine Museum. His research included examining 19th century maps of the Penobscot River area in an effort to locate a slipway large enough to accommodate a 200-foot vessel. His challenge was that in the 19th century, there were 40 towns on the Penobscot with slipways for constructing ships and he had to find a specific site. After careful study he found both the slipway and house of the builder, Isaac Dunham, in present-day Winterport. Earl finished the SPITFIRE in 2000 and it was sold at the Maritime Museum’s annual fund-raiser for $20,000. Hello, everyone. At some point this summer, either in person or on Facebook, you’ve probably come across my name, but I’ll introduce myself again. I’m Polly Bickford-Duane, the intern at the Orrington Historical Society. I’m going into my senior year at Wheaton College in Massachusetts and double majoring in English literature and French. I grew up in South Orrington and Judith Gillis, president of the OHS, used to be my middle school English teacher. We connected last winter for the first time since then to discuss what I could do for the Historical Society, and realized that an internship would both give her the extra help she needed and allow me to add a great experience to my resume. Over the summer, Judith and I have been busy (if you know her personally, you know she hardly takes the time to breathe). Among other projects, we’ve been interviewing residents of our community about what life was like when they were growing up. Here in Orrington we’re lucky to have a number of people who are willing to share their stories with us. Judith and I have also been working on the digital repository at the Maine State Library. It’s essentially an online database for old books and personal records. Judith and I use the new cradle scanner at the library, which allows you to scan books without flattening the spine. The file of the book then goes into the Maine State Library database. Thanks to Adam Fisher, who works at the library and manages the digital repository, we’ve been able to integrate the Orrington collection with our new website. If you visit our Special Collections page you’ll find all the books Judith and I have scanned so far. We hope to scan even more in the future, so the page will be continuously updated. Speaking of our website, my main project this summer was updating ours. It has been redone in a completely new format and I hope it’s both informative and easy to use. Working on the website has been a lot of fun for me – it’s an opportunity to exercise my creativity and improve my technology skills at the same time. Clearly, this summer has given me a range of new skills to add to my resume, but it has become more than that. Working with the Orrington Historical Society has been an incredible experience and has taught me to appreciate history in a way that doesn’t always come across in a classroom. Interviewing people about their lives has made me realize how important it is to keep history alive in a format accessible to as many people as possible. With that in mind, I’ll be working as much as I can with the OHS even as I head back to school – I’ll be managing and updating the website from my dorm room two states away. If you have any questions, comments, concerns, or historical or genealogical information to share, please contact us at info@orringtonhistoricalsociety.com or post on the Orrington Historical Society Facebook page. We look forward to hearing from you.